Abraham is very old now. So he called his faithful servant, Eliezer, to him. The servant, Eliezer, took 10 camels along with him and set out for Nahor. Eliezer arrived at a well outside the city. He then made his camels kneel down by the well. Before Eliezer finished speaking, a beautiful young woman called Rebecca came out from the city to fetch water with the pitcher on her shoulder. Rebecca is the daughter of Bethuel, the son of Milcah. Milcah is the son of Nahor. Nahor is Abraham’s brother. Eliezer said to her, “Please let down your pitcher so that I can have some water to drink”. After the camels had finished drinking, Eliezer took a very expensive gold nose ring and two hand bracelets and give it to Rebecca. Rebecca told Eliezer where she was the daughter of Bethuel, from the family of Nahor. Rebecca’s brother, Laban ran out to meet Eliezer who is by the well. Laban invited Eliezer to spend the night at their home. Eliezer also give gifts of silver, gold, and clothing to Rebecca. He also gives gifts to Rebecca’s brother and mother. And they eat and drank all night. They ask Rebecca and Rebecca agreed to go back to Laban. So they sent Rebecca and her maid away. When they arrived home, Isaac saw Rebecca and was very happy. 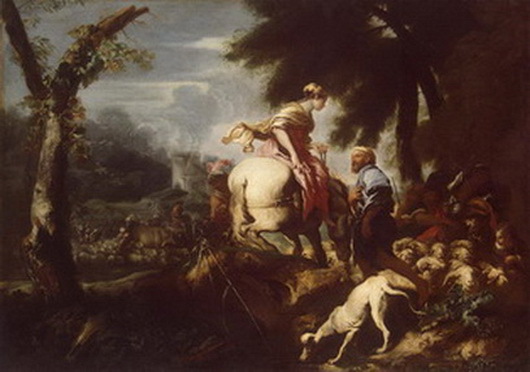 Isaac then took Rebecca as his wife.